( May 27, 2014, New Delhi, Sri Lanka Guardian) With the leaders of eight neighbouring countries in the city, Prime Minister Narendra Modi’s first day in office on Tuesday will be dominated by his meetings with them. The bilateral meetings will begin at about 9.30 am and go on till about 1.30 pm. Pakistan Prime Minister Nawaz Sharif is seventh on the list, and is expected to meet Modi a little after noon. The meeting is expected to define Modi’s foreign policy agenda. Sharif will also extend a formal invitation to Modi to visit Pakistan. Modi’s first bilateral meeting will be with Afghanistan President Hamid Karzai, followed by Maldives President Yameen Abdulla, Sri Lankan President Mahinda Rajapaksa, Bhutan’s Prime Minister Tshering Tobgay, Mauritius Prime Minister Navin Ramgoolam, Nepal’s Prime Minister Sushil Koirala, Sharif and Bangladesh Speaker Shirin Sharmin Chaudhary. The meetings, which will be held at Hyderabad House, are expected to last for about half-an-hour each. The order of the meetings was decided by South Block’s protocol division, keeping in mind the well-defined principles. Sources said the meetings will essentially “develop a chemistry” and talk about “ways to enhance cooperation”. Modi is learnt to have been briefed on the bilateral issues with each of these countries by senior officials of the Ministry of External Affairs (MEA). The new External Affairs Minister and the Foreign Secretary also take part in these meetings. Meanwhile, Sharif said on Monday that he intended to “pick up the threads” from where he and the then Prime Minister A B Vajpayee left off in 1999. He told the media in Lahore, before leaving for New Delhi, that he was going with a “message of peace”. Sources said Sharif is also likely to make a “courtesy call” on Vajpayee on Tuesday afternoon, before he leaves for Islamabad. 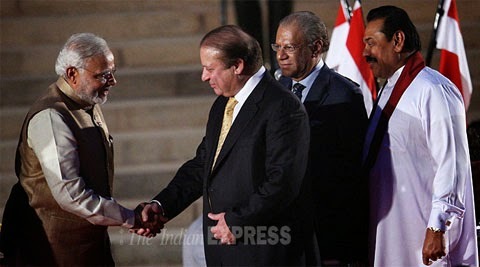 During the swearing-in, Sharif was seated between outgoing Prime Minister Manmohan Singh and his wife Gursharan Kaur, and was seen chatting with them. He also had a short chat with Afghanistan President Hamid Karzai.